When hanging socks on the line to dry, hang them in matching pairs. That way when they are dry and you remove them from the line, you can fold them together straight away. It saves time sorting and folding later. 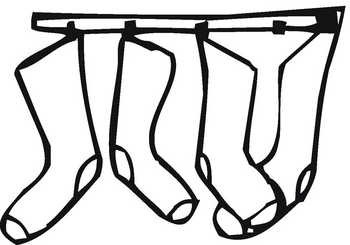 My husband taught me this hint: if you hang the socks by their toes it's even quicker. I hang them in pairs by the toes too, but before I take them off the line I go along and quickly fold each pair up to the peg. Then I just zip along the line, unpegging and dropping the folded socks into the basket. Great suggestion Cath but my socks don't even make it to the line in pairs....I think the washing machine eats them !! I have a pile of unmatched socks that have no partners...very annoying.